Winter in Pennsylvania is the most ridiculous season there is. There is no stability in the weather what so ever. It can go from 10 to 60 degrees without warning, one day you could be wearing four layers and stalking carp in the snow other days a single micro fiber will do. Along with my layers of clothing I like to vary my fly selection this time of year as well. During the winter months I tend to use brighter patterns to grab their attention. Sometimes a drab color is not enough motivation for a lethargic fish to go out of its way for your fly. I think the jig is up. Egg flies work on carp. Haha, I was unaware of this jig. They sure do work. Good going guys, the weather the last couple days has been particularly unpredictable! I agree. I shaved a beard off after 17 years. My face was damn cold in the winter after that. Yes egg flies work, at times so well that becomes all I use (but not all I carry.) Can't wait to use my spawn ties after this. Good job and lucky you for the chance to present them. Adam, great post. Can I ask the size hook used in the cold, and was it weighted at all? Did you see the fish, and were they dormant or moving on the day. Thanks, it makes me long to get out. Rich, The flies were weightless #12-14. 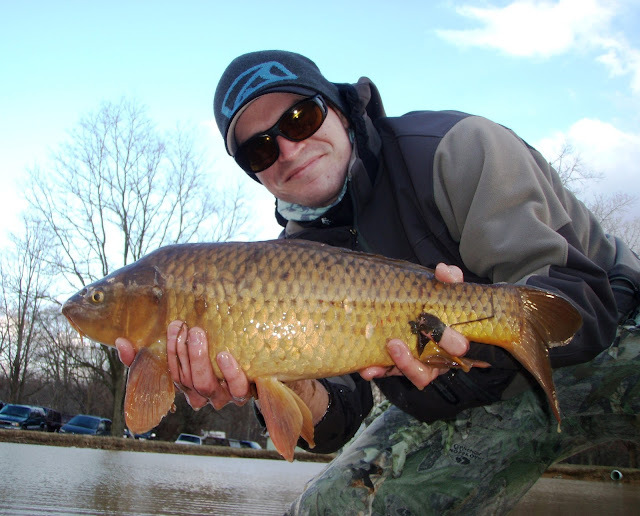 Carping is 100% sight fishing for me. One of the days I fished the air temperature was in the mid 50's (F) and the fish were laid up on the surface/slowly cruising at the surface. The other days I was out the temps were in the 20's and I was targeting tailing fish. 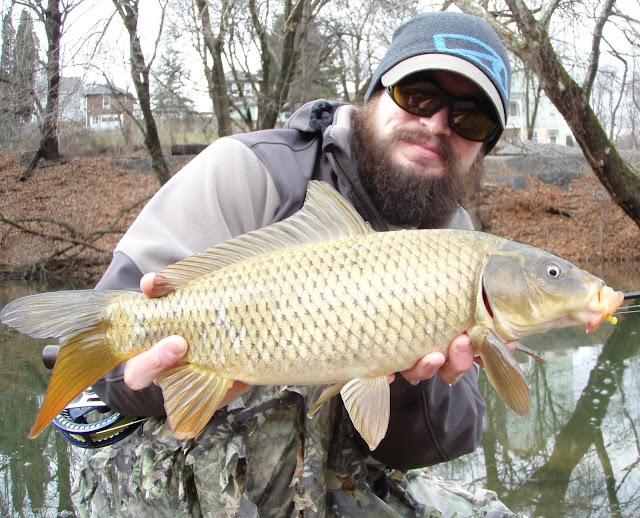 With water temps in the upper 30's the fish will not move far for a fly. Very nice. I think i may need to sit down at the vise and tie some spawn. Your carp flies piece of SWC was great btw. Cheers.